Sister of Charity Mary Alicia Bomya greets visits at the Front Desk of the Sisters of Charity Motherhouse, one of her many volunteer ministries. As a fourth-generation teacher, S. Mary Alicia has spent her life valuing the education of children. She has ministered in classroom teaching, school administration, and as a college registrar, which has taken her to many schools across the country. Her last 13 years of active ministry were spent as a pastoral associate at National Shrine of the Little Flower Catholic Church in Royal Oak, Michigan, where she was in charge of Christian service. Retiring at 75 years of age, S. Mary Alicia tutored small groups of children at the Shrine. She recalls a fond memory of teaching the children who struggled with long division. She taught them the “old-fashioned way,” of doing it which they happily understood. S. Mary Alicia says her volunteer ministries are more focused on service than teaching was, but in a way, teaching for Sister was service because she not only helped the children learn, but also helped them to become good and kind children of God. S. Mary Alicia enjoys staying active, and takes walks around the Motherhouse grounds every day, so that she can continue to keep her good health and to be able to help the Sisters who are less fortunate in health and mobility. She says, “I do a lot of volunteering because I feel like I’m giving back to the Sisters.” Whenever she has time, she runs errands for any Sister who asks, and enjoys being able to drive and take them places, like the library or stores. She says she likes to help others in her own little way. 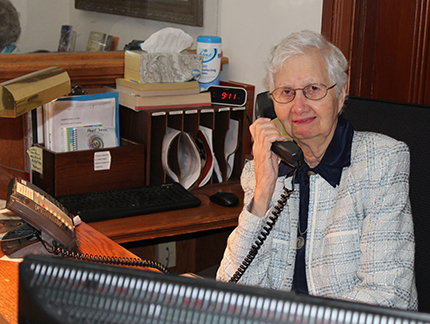 Currently, she volunteers at the Motherhouse’s Front Desk, where she enjoys giving people a positive and welcoming first impression of the Sisters of Charity. She reads at Mass once a month in the Motherhouse chapel, and often acts as a Eucharistic minister. S. Mary Alicia also volunteers at Bayley, a retirement and wellness community sponsored by the Sisters of Charity in Cincinnati, where she conducts a holy hour each month.